This is a hearty and savory stew with plenty of protein and veggies. It’s a one pot meal that is easy to make. My family loves eating this stew topped with minced green onion and served alongside some crusty bread. Enjoy! 1. Hit the ‘’Saute’’ button on your Instant Pot. Saute the sliced turkey kielbasa in your Instant Pot, using tongs and a spatula to turn over the sausage until evenly cooked and nicely browned. Add in the minced onion and minced garlic and cook with the turkey kielbasa until the onion is translucent. Add in the baby carrots or sliced carrots and celery and cook until the celery softens. 2. Add in cumin, turmeric, dashes Italian seasoning, the lentils, the broth, and the kale. Stir to make sure everything is mixed. Secure the lid. 3. Make sure the steam release valve is in the ‘’Sealing’’ position. Press the ‘’Manual’’ button to begin cooking and cook at high pressure for 15 minutes. Do not make any changes to the pressure. 4. After 15 minutes, hit the “Keep Warm” setting and keep it on this setting for 10 minutes. Allow the pot to reduce in pressure naturally and do not open the steam release valve. After 10 minutes on the “Keep Warm” setting open the steam valve and allow it to release the pressure. You may want to put a paper towel over the steam valve so that it doesn’t spray. Carefully and slowly open the lid when the steam is done releasing. 5. Taste the stew and season with salt, pepper, Italian Seasoning, and Cavender’s Greek Seasoning. Serve bowls of the stew with minced green onion on the side. Allow each person to put as much green onion as they wish. This stew is also great served with crusty bread. 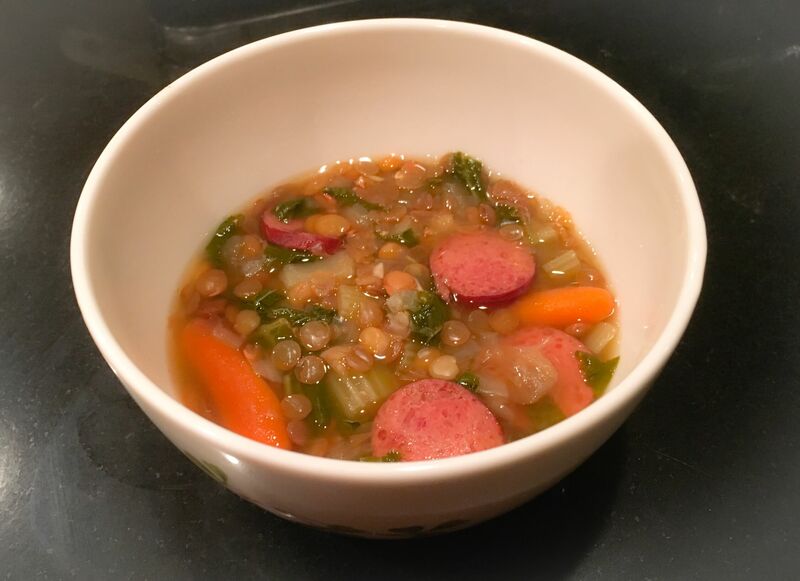 * If you wish to make this stew vegetarian, simply substitute vegetable broth for chicken broth and omit the turkey kielbasa sausage. * Alternatively, after the sausage is cooked, you can remove it and serve it on the side. This is a good option if you are serving both carnivores and vegetarians. * Green onion grows quickly. You will find if you save the roots of the green onion, they will grow if placed in a cup of water. * I like using kale in this recipe but you can also use spinach. Jax Chronicles Now Blogging For Sacramento4Kids! !